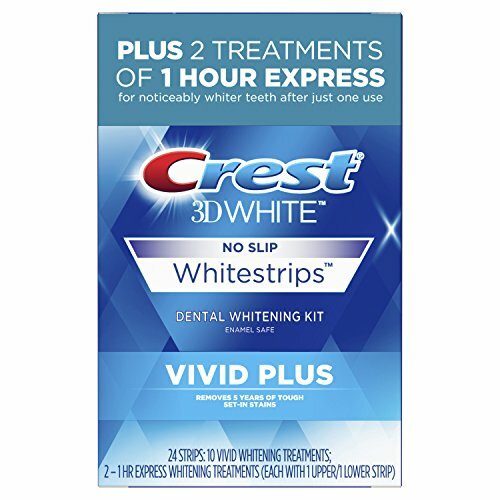 Crest 3D White Vivid Plus Whitestrips include 10 treatments of Crest Vivid Whitestrips and an additional 2 treatments of Crest 1 Hour Express Whitestrips to help you reveal a brilliantly whiter smile. Crest Vivid Whitestrips remove five years of tough set-in stains. Their no slip grip means the strips stay put until you take them off, allowing you to talk and even drink water while whitening your teeth. You’ll see a whiter smile after 3 days, and full results in 10 days. And when you need some last-minute teeth whitening, 2 treatments of Crest 3D White Whitestrips 1 Hour Express are included so you can experience a whiter smile in just 1 hour.